This photo — taken on Jan. 13, 2015 by one of the Curiosity Mars rover's hazard cameras — shows the rover in position for a mini-drill test on a rock target called "Mojave." NASA's Curiosity rover may be about to collect samples from another Martian rock. The 1-ton Curiosity rover began conducting "mini-drill" tests on a rock dubbed Mojave this week, to assess the stone's suitability for a full-up drilling and sample-collection operation. Curiosity's handlers are keen to learn more about abundant lozenge-shaped features within Mojave that appear to be mineral crystals, NASA officials said. "The crystal shapes are apparent in the earlier images of Mojave, but we don't know what they represent," Curiosity project scientist Ashwin Vasavada, of NASA's Jet Propulsion Laboratory in Pasadena, California, said in a statement. "We're hoping that mineral identifications we get from the rover's laboratory will shed more light than we got from just the images and bulk chemistry." This photo, taken on Jan. 13, 2015 by the Mars Hand Lens Imager on NASA's Curiosity rover, shows the results of a mini-drill test to assess whether the "Mojave" rock is appropriate for sample-collecting drilling. The crystals may be salts left behind when a lake evaporated, or they may be the result of water moving through the rock, Vasavada added. "In either case, a later fluid may have removed or replaced the original minerals with something else," he said. Mojave is part of an outcrop called Pahrump Hills, which lies at the base of Mount Sharp. Mount Sharp rises 3.4 miles (5.5 kilometers) into the Red Planet's sky from the center of the huge Gale Crater. Curiosity has been exploring Pahrump Hills for several months now; in fact, the rover drilled into, and collected samples from, a different portion of the outcrop in September 2014. Curiosity also inspected the Mojave rock with its close-up camera and X-ray spectrometer in November. Lozenge-shaped crystals are apparent in this view of the Martian rock target "Mojave," taken by the Mars Hand Lens Imager (MAHLI) instrument on the Curiosity rover's arm. 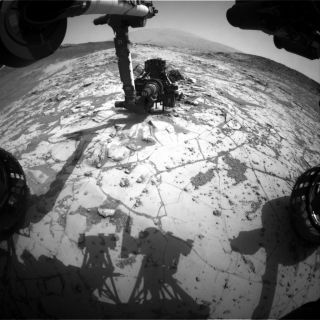 Curiosity has conducted four sample-collecting drilling operations to date. This work — which involves the delivery of powdered rock to the rover's onboard analytical instruments — allowed mission scientists to determine that Gale Crater hosted a lake-stream system billions of years ago that could have supported microbial life. If Curiosity does end up drilling Mojave, the operation may be complicated by a software update. The rover will likely suspend science operations for a week beginning early next week when the rover's handlers send up new flight software. It will be the fourth new version Curiosity has received since touching down on Mars on August 2012. The software should help Curiosity drive more efficiently, among other benefits, NASA officials said.